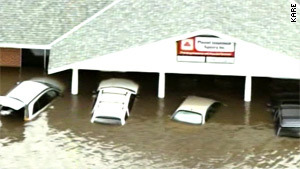 Severe flooding is gripping parts of the Midwest as torrential rains force rivers to overflow, submerging entire towns. The worst of the weather stretches from Minnesota, Wisconsin and Iowa, where flood warnings continue to be in effect. Evacuations are still going on in several towns as forecasters predict flooding could be a problem through the weekend. Water from swollen rivers and streams will continue to push southward, pushing rivers over their banks. Governors in Minnesota and Wisconsin have declared a state of emergency for areas affected by the flooding. Schools remained closed in many flooded-out towns in the Midwest Today. In Black River Falls, Wisconsin, a Red Cross shelter has been set up at a local church to house the evacuees. KARE-TV reports 11 inches of rain fell there as 18 counties in Minnesota continue under the flood warnings. It’s the first time a hurricane has churned through the Gulf of Mexico during an oil spill so there are many unknowns tonight as to how Hurricane Alex will affect coastal areas. Alex strengthened this afternoon as it takes aim at the Texas / Mexico border and it’s expected to strengthen to a Category 2 storm before making landfall Wednesday night. As of 11 a.m., the National Hurricane Center says Alex was moving WNW at 7 mph with maximum sustained winds of 80 MPH. 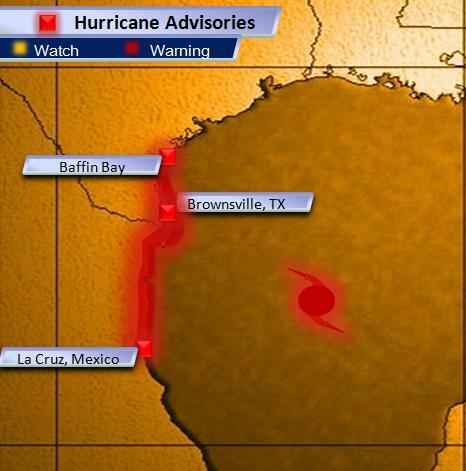 Hurricane warnings have been posted from Baffin Bay, Texas, southward to La Cruz, Mexico. Tropical storm-force winds are expected in the warned area within the next few hours. The storm’s rotation poses a risk of tornadoes this evening. The National Weather Service has issued a tornado watch for southeastern parts of the Texas coast until 8 p.m. [local time]. Flooding rains, damaging winds sustained at 90 MPH, with higher gusts, can be expected as well as severe thunderstorms, flash floods and tornadoes. 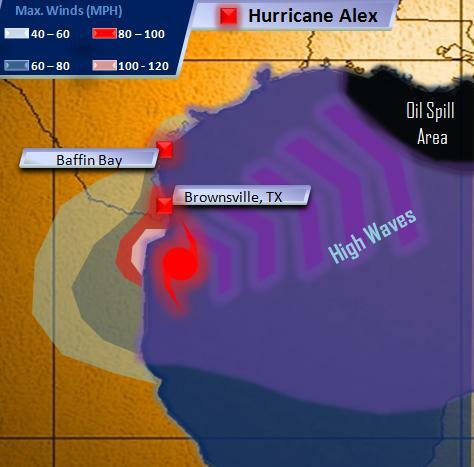 Hurricane Alex is not expected to directly hit the areas currently dealing with the BP oil spill in the Gulf; the storm will pass far to the southwest of the spill. But meteorologists fear the outer wind fields and rotating feeder-bands could be strong enough to push more oil further inland in coastal areas already devastated by the affects of the spill. Waves up to 15 feet could crash onto beaches as far away from the impact zone as Florida; possibly pushing the thick crude further onto the white sand beaches that line the Gulf coast. 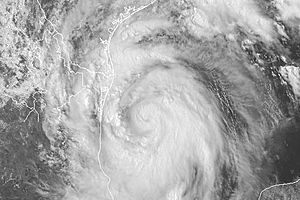 Other researchers hope the storm will cause the opposite effect; stirring up the oil and pushing it further into the Gulf. As I mentioned, this is an unprecedented event so no one really knows what the hurricane will do with the millions of gallons of oil spewed so far. Oil and gas operators in the Gulf have begun evacuating rigs within the path of the hurricane. The Bureau of Ocean Energy Management, Regulation, and Enforcement told reporters Tuesday 28 platforms and 3 rigs have been shut down; that’s nearly a quarter of the Gulf’s oil production and 9 percent of its natural gas production. Rough seas have caused BP to bring their skimming boats to safe harbor, putting a delay into the oil spill clean-up efforts. While those boats are out of commission, the oil will continue to spill, unchecked, until it’s safe to get the vessels back to the spill site.